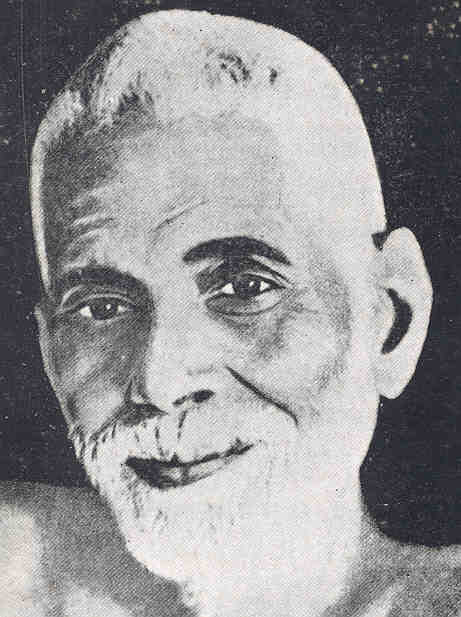 Ramana Maharhshi was a guru of international renown from southern India who taught during the first half of the twentieth century. He was born in 1879 near Madurai, Tamilnadu. His father was a farmer. He was the second of three sons. The family was religious, giving ritual offerings to the family deity and visiting temples. One unusual aspect of his family history was a curse that was put on the family by a wandering monk who was refused food by a family member. The monk decreed that in every generation, one child in the family would renounce the world to lead a religious life. Ramana was largely disinterested in school and absent-minded during work. He had a marked inclination towards introspection and self-analysis. He used to ask fundamental questions about identity, such as the question "who am I?". He was always seeking to find the answer to the mystery of his own identity and origins. One peculiar aspect of Ramana's personality was his ability to sleep soundly. He could be beaten or carried from one place to another while asleep, and would not wake up. He was sometimes jokingly called "Kumbhakarna" after a figure in the Ramayana who slept soundly for months. In the summer of 1896, Ramana went into an altered state of consciousness which had a profound effect on him. He experienced what he understood to be his own death, and later returned to life. He also had spontaneous flashes of insight where he perceived himself as an essence independent of the body. During these events, he felt himself to be an eternal entity, existing without reliance on the physical body or material world. Along with these intuitions came a fascination with the word "Arunachala" which carried associations of deep reverence and a sense that his destiny was closely intertwined with this unique sound. At the age of sixteen, Ramana heard that a place called Arunachala actually existed (the modern town's name is Tiruvannamalai) and this brought him great happiness. Ramana was nearing the end of high school when a careless criticism describing him as a person not fit to be a student jarred him into making a final decision to leave school. He had been reading a book on famous Tamil saints and resolved to leave home and lead the life of a religious seeker. Naturally, he planned to go to Arunachala, the place which was the focal point of all his religious ideals. When he was seventeen years old, Ramama left for Arunachala, arriving after four days of mostly train travel. He went directly to the central shrine at the temple and addressed the Shiva symbol (linga) stating he had given up everything and come to Arunachala in response to the god's call. Ramana spent ten years living in temples and caves meditating, and pursuing spiritual purification, keeping the disciplines of silence and non-attachment. At this point, his reputation as a serious teacher (he was called Brahma Swami) began to grow and other seekers began to visit him. His disciples, some of whom were learned individuals, began to bring him sacred books. He became conversant with the religious traditions of South India written in the different regional languages. Early disciples had a difficult time learning about Ramana's background and even his native language because he was silent and refused to speak. As time passed he ceased his ascetic phase and began to live a more normal life in an ashram setting. Many people came to visit him with a variety of problems, from both India and abroad. Ramana's disciples constructed an ashram and temple, and space the accommodate the many visitors. All ate the same food and Ramana sat with the rest of the people during meals and did not expect special treatment. The ashram was a sanctuary for animals and Ramana had great fondness for the cows, monkeys, birds, and squirrels that inhabited the grounds. Ramana continued to practice the method of inquiry into the nature of the self best expressed by the question "who am I?". Ramana was not a guru in the classic sense of a teacher who gives instruction on a regular basis or gives mantras during initiation. In fact, if the seeker wanted to practice repetition of a mantra rather than the "who am I?" method of self inquiry, he recommended repeating the pronoun "I" or the phrase "I am" rather than repeating sacred Sanskrit words or the names of gods. This focused the person's mind on "being itself" or the mystery of their own awareness rather than an external object or word. ... although the Guru , or teacher is within everyone as primal awareness, an illuminated sage can push us in the direction he described as inward in the sense of being more primary, or primal. Ramana could give this initiatory push by touch or by glance. Seated in silence, he would suddenly turn, fix one with an intense gaze, and the person would become directly aware of the right-hand Heart (the spiritual center of one's awareness) and its vibrant current of primal awareness. Those who experienced the power of Ramana's gaze have reported that the initiation was so clear and vivid that they could never again seriously doubt that the Guru was none other than their own primal conscious being. Some years ago, the author met a saint who called himself Sunyata. He was Danish but had been invited to come to India by Rabindranath Tagore, the poet and artist who received the 1916 Nobel Prize for literature. Tagore, while visiting Europe, recognized Sunyata's extraordinary stillness and meditative frame of mind and thought he would find India a welcoming place. Once in India, Sunyata lived as a hermit in silence for almost five decades in the Himalayas with neighbors like Lama Govinda and Dr. Evans-Wentz. Those who knew him in that area would sometimes send seekers from the West to meet with him and experience his presence. Never before had I awared [become aware of] such integral Self-Radiance in any human form, such light of Silence. One was being fed just awaring him. At the first sight of him, I felt no excitement or even awe, no solemnity or ecstasy, simply a calm recognition, a glad contentment, and gratitude in his darshan. The experience had such a profound effect on him that he adopted the name Sunyata and used it for the rest of his life. Curiously, Ramana used the Buddhist term sunyata which is sometimes translated as the Buddhist Void or emptiness rather than a Hindu term closer to his own cultural tradition. Sunyata also denotes the illusory or insubstantial nature of phenomena. The idea that we are always aware with some portion of our being of the ultimate reality is a common view in many yogic traditions. It takes silence, focused awareness, and a process of sifting through and in the language of the phenomenologist bracketing out one's myriad thoughts and impressions to become aware of this underlying reality. Ramama was simply emphasizing this fact to Sunyata by creating a powerful mental impression that would affect him for decades. Such was the power of Ramana's presence that he could have a profound impact on visitors and change the course of their lives in an instant. Ramana also initiated people in dreams by gazing intently into their eyes, and he would sometimes travel in the subtle body to visit people. He would appear to a disciple hundreds of miles away as a luminous figure, and the person would recognize his appearance in that form. He noted that one's waking life and one's dream life were both a kind of dream each with different qualities of awareness. He referred to them as "dream 1" and "dream 2". He therefore did not make a big distinction between appearing to a waking disciple and a dreaming disciple since he considered both spheres of existence to be dreams. Ramana recommended renunciation of enjoyment of physical and mental pleasures as a means of entering into a state where the oneness of the self and cosmos could be perceived. He also felt that a person who is not attached to the results of his actions can live in the world like an actor that plays his or her part but is immune to emotional disturbance, because he realizes he is only play-acting on the stage of life. Ramana was able to demonstrate his own non-attachment when thieves broke into the ashram and he counseled the disciples and visitors to let them have anything they wanted. He remained calm during the incident even when struck by one of the thieves. He also displayed no loss of equanimity at the death of his mother, who had come to live at the ashram after selling the family home. Ramana developed cancer and when his devotees voiced concern about losing him, he responded with the statement "I am not going anywhere, where shall I go? I shall be there where I am always." This is the statement of an enlightened sage - a person where the conflict between life and death is felt no more. He died in April, 1950, sitting in lotus position. The final word that passed from his lips was the sacred syllable OM. I saw a shooting star with a luminous tail unlike any I had ever seen before moving slowly across the sky and reaching the top of Arunachala, the mountain, disappearing behind it. We immediately looked at our watches. It was 8:47. We raced to the ashram only to find that the master had passed in to Mahanirvana at that exact minute. Nor was this experience only documented by a select few � All the English and Tamil papers which arrived this morning from Madras referred to the meteor which had been seen in the sky over the entire state of Madras at 8:47 on the night of April 14 by a large number of people in different places. These eyewitnesses had been struck by its peculiar look and behavior. Ramana who often circumambulated the sacred mountain as an act of worship seemed to be making his final arc around the mountain as a blazing light in the night sky. Many Westerners who practice the devotional traditions of Judaism and Christianity may see this focus on being itself in yoga as alien or unrelated to their traditions. However when Moses asked God to identify himself in Exodos 3:15 when he encountered him as a burning bush, God replied, "I am that I am". In the Hebrew, this is YHVH (Yod Hey Vav Hey, the Tetragrammaton, or the "4 letters"), and its variations later became the "names" Yahweh, Jehovah, and G-d. These are not proper names but instead refer to the highest quality of God which is being. Being is primary and all other qualities and attributes of God depend on this attribute which is so holy that Jews do not mention it directly. Words like Adonai (my Lord) and Hashem (the Name) are used to refer to God's name which is transcendent, ineffable, and is too holy to ever be spoken. So it is appropriate that the devotion in these Western traditions be directed towards the most sacred aspect of God which is his existence as expressed by the phrase "I am". This phrase was used twice by God in answering Moses' question when God was asked to identify himself. When these Western religions evolved into traditions of devotion and the ritual worship of God as creator, judge, and savior with new prophets, revelations, texts, and incarnations, the emphasis on divine being became less important. However many Eastern Yoga traditions such as Jnana Yoga continued to focus on this divine attribute of being as a divine quality present in all life. Being is something that human beings share with the creator or ultimate reality. This effort to directly perceive the pure attribute of divine awareness and discover the essence of being independent of matter, thought, and other qualities is something Ramana encouraged. In spite of changes to Western religion, this method of seeking to encounter Being (or God's essence) directly as Moses did in the desert is arguably something Westerners can relate to and respect as a religious practice because of their Judaic and Christian roots. Encountering being in its pure form whether it is symbolized as the deeper Self or as God's essence is the goal of yoga, and is not so different from the goals of these Western religious traditions.